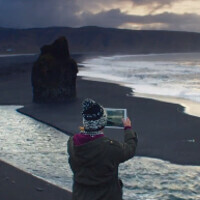 Apple has introduced two new ads for the Apple iPad Air, that focus on the slate's musical abilities and its ability to help you navigate your way around the planet. The first spot features conductor Esa-Pekka Salonen. In the ad, Salonen discusses the creation of his app called "The Orchestra," which brings classical music to the layman. "I'd be delighted if somebody would discover classical music through The Orchestra," says the conductor. Salonen also reveals how he use the Apple iPad Air, loaded with apps, to create some of his classical compositions. Talking about the iPad, Salonen says, "I have this total freedom to go back and forth between my full studio and the most portable setup I can imagine." The second ad features travel writer Cherie King, who was born without hearing. With her trusty Apple iPad Air, and the use of a few select apps, she can travel anywhere, inspiring others with the same impediment, to take to the road. Both ads link to special iTunes pages, one dedicated to Salonen and the other on King. You can check out both new commercials by clicking on the video slideshow below. Galxy Tab 4. That is all. Actually tab 4 is way better than ipad air because of very good multitasking, multi window, micro sd support, otg support, 19:10 ratio, stereo speakers and so one..! It has a long way for comparison with note 10.1 2014 and tab pro 10.1 ..! these "what will your verse be" ads have been really bad. both of these are bad, but the second is the better of the two. Its interesting that they dont show anything unique to the ipad. They just show them taking pictures, emailing, translating... its all generic stuff. Lame commercial is the worst commercial possible. Nokia did this first. idamn u ifruit!!!! Apple ads have been pretty poor lately. Actually, I don't think so. Other than USA, Apple doesn't really advertise their products itself and they are selling like hotcakes. Cool and logical ads. Practicality equals sales. I like that apple strives to show the actual uses and practicality of their devices, not just specs. Appeal to the masses is an important strategy in the business world, and for the consumer, it shows us why we'd like a certain product and the things we can do with in our day to day lives. As an iFans i would like to see the old iPod ads back again. These ads are kind of lack of inspiration and boring. Are this together with the Powerful ads apple recently made cause i think thats the best ads apple made recently !? I'm an iPad Air owner. Even though I love it I think there is something happening with Apples OS lately. It's fast and stable most of the time but when I leave apps running at the background without swiping to close them, I realize my iPad stutters and gets laggy. Even in the home screen. Am surprised the reviews never stated this. I bought this iPad after the review phonearena did and I don't want to say I regret my decision but I believe it should have been mentioned that it stutters due to low memory. Even subway surfers, asphalt 8 and GTA stutters once in a while. Apple user are mostly in love with the brand and will over look all flaws. Just tell yourself its perfect 100 times a day and it will be. You just did. Android is not a novice OS. I can tell every single activity on the phone. Which apps access what device at what time or wake the screen up how many times an hour. Users can monitor everything that going on the phone. Apple lover know nothing about the innate of their phone just the way Apple likes it. Just love your magical device and leave everyone else in peace. Cheers! My mini 2, and 5s stutters from time to time. I've never had a device that didn't, so I just deal with the hiccups as all devices have them. Nothing will be prefect, and I agree that any issues should also be mentioned in a review. Apple needs to up their RAM in there iLine. It's not enough, for running a ton of intense stuff. I think they need to adopt Samsung's approach in that area. Sammy bloats the heck outta there devices, but plug in a ton of RAM too it stutters, but not as much. Nothing is perfect that true and everyone has different needs. However, I do remember my first iPad has no lag. It has the perfect hardware and software balance in its time. Hope Apple will restore that balance by giving their next gen device better hardware. iPads are great! I use them for strengthening my patented roundhouse kicks. I can smash through 8 of them stacked together currently. If anyone knows of a better use for them I am open to suggestions.